Several years ago, I bought an ancient 4-harness LeClerc Nilus floor loom and began to learn to weave cloth. So far, I’m doing pretty well, if I do say so myself. Every serious weaver knows a project which turns out well links directly to the quality of the warping job. If the warp isn’t right, the quality of the entire project is in jeopardy. In fact, if the warp isn’t right and the project turns out well, the weaver surely is riding a wave of pure luck. The next time, the project could become a disaster. Warping with assistance is better in some respects than warping alone. However, unless the person is a weaver or knows what is happening to the threads and why you do this or that, there can be some real lash-ups (to use a fishing term). Frustration can cause harsh words and a volunteer helper may walk away. It is a shame to put yourself, let alone family and/or friends, through this sort of trauma. For me, warping alone has been hit and miss. A lot more miss than hit. I can perfectly install a fairly short warp of sturdy rug yarn, and the project will be wonderful. But a long warp of fine yarn is nearly impossible. Subsequently, I have stayed away from projects I want to do because of the yarn size or length. Lately, I’ve been reading about warping with a trapeze as done on Glimakra looms at the Vavstuga Weaving School in Sweden. The trapeze keeps warp under tension and in view while a lone weaver takes necessary steps to get it firmly and evenly wound around the back beam. A tangle-free warp is the result. My sister has a Glimakra loom, for which she constructed a working trapeze. After she finished it, she sent me a photo. She loves this method and has integrated it onto her list of favorite warping tools. She uses it almost exclusively now, and hasn’t used her sectional warping tools for some time. 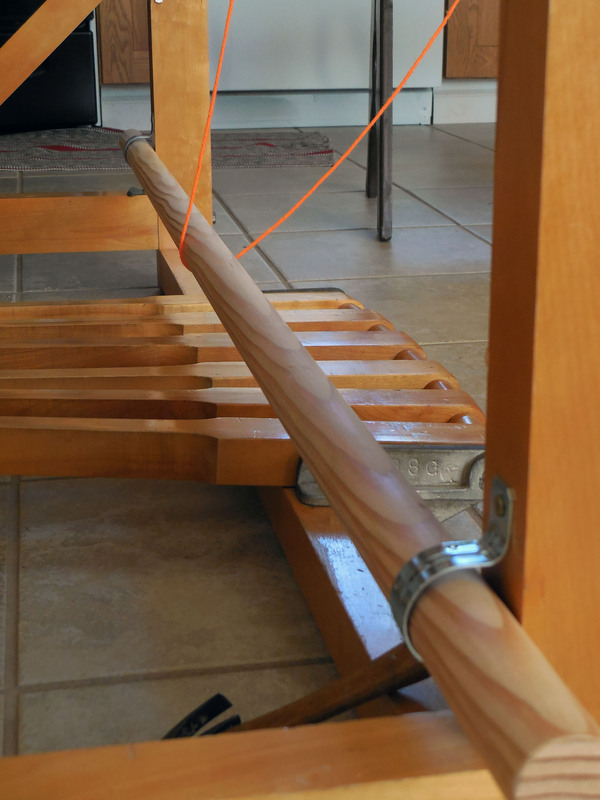 Well, as I stated above, I have an old LeClerc Nilus, so making a trapeze which will work on my loom has run into a few challenges, like the fan shaped treadle mechanism attached to the foot rail. My sister and I consulted. I made drawings and plans, ordered more Texsolv (just in case). Then I called in my son who builds houses. He immediately understood what was needed, improved on my plan, and constructed a trapeze for my loom. All I had to do was vacuum up the saw dust. On my loom, the front (cloth) beam must be removed to install and use the trapeze. This is easily done. And replacing it afterward is no problem at all. · 2 heavy duty closet rods six feet long cut about 12″ longer than loom width. Mine were cut to 5 feet. · 2 boards ¾” by 2 ¾” seven feet long (could be shorter if your ceiling is low, but seven feet sounded good to me). · Bolts with butterfly nuts & washers ¼” x 3” or 4” or whatever it takes to go through the castle and the board. Or a clamping system of some sort that will hold the boards firmly. · Four “C” shaped holders to secure the ends of both rods. And that’s it – oh, yes, one more crucial thing – the right tools, or a willing handy person, to measure everything correctly, drill holes in your castle and attach the rod holders. If you cannot bear to puncture your castle, you can use a wooden clamping system similar to the clamps that come with the Glimakra loom. Note: With the use of a trapeze, a pre-reeding process (to be described in a later post) is used to guide the warp onto the back beam in both correct project width and proper warp distribution. My own trapeze has 6 yards of warp in view as I wind on! That’s 5 yards under tension in front of the reed and another yard or so behind the reed to my tie up method on the back beam. This enables a full view of a good length of warp while the weaver has hands free to wind-on the weighted warp and place sticks as required. The trapeze is easy to assemble and disassemble. The pieces don’t take up much room and can be stored behind a door or in a closet. The hardware (bolts, clamps, whatever) can be stored in the weaving bench with other weaving tools. Weight of the bar is on the brace. 1- It works best to split the warp into two chains of approximately equal size for a smallish warp and into three or four similar chains for a large warp. It will take a separate weight for each chain. 2- At first, I used gallon jugs nearly full of water for weights. This made the job so difficult I could hardly turn the crank. Using a trial and error method, I found that a gallon jug filled between 1/4 and 1/3 full works just fine. There is plenty of weight to keep tangles from forming and it is much easier to wind. So, my conclusion is that the weight should be just enough to hold the warp taut so that the threads don’t tangle. It doesn’t need to be tight enough to stretch the warp threads. The object is that it has to be even in distribution, untangled and straight from reed to back beam.